Virginia creeper (Parthenocissus quinquefolia) is a perennial woody vine that climbs on other objects or trails along the ground. It is a common weed of orchards, vineyards and blueberry plantation. It is best identified by the typical palmate leaf with 5 leaflets that originate from the same point (picture 1). Virginia creeper will produce many tendrils with adhesive disks at their tips that will allow the vine to climb upward and to attach to any support. It can grow under a wide range of conditions including dry sandy or moist organic soils, sunny or shady sites, and is tolerant to high salinity. Plants will often establish through seeds dropped by birds who consumed the small blue berries in fall, but also by the spread of crawling stems that will produce new roots in contact with soil (picture 2). Virginia creeper is often confused with Poison-Ivy (Toxicodendron radicans). However, poison-ivy has 3 leaflets instead of 5 for Virginia creeper and lacks the tendrils and adhesive disks. As a perennial weed, Virginia creeper will be tough to control as it can easily regrow after foliar injury from its extensive underground root system. 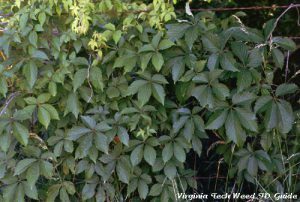 When established, Virginia creeper will most often not be controlled with a single herbicide application, and multiple applications will be necessary to achieve acceptable control. Only nonselective postemergence herbicide (glyphosate) must be used to suppress or control this weed. In order to increase the efficiency of postemergence applications during the growing season, remove the vine from their support during winter pruning and lay it on the ground or plan a “cut stump” treatment during the growing season. Do NOT “prune out” the vine during the dormant season. Spot treatment. Glyphosate may be applied in mid- to late summer after vine flowers in early July until the first signs of fall color appear in the foliage. Good growth and maximum leaf area is needed at the time of herbicide application during the summer. Wet a minimum of 50 percent of the weed foliage with a 1% glyphosate solution (1.25 oz of 4.5lb acid material per gallon of water) for effective control. For best control, don’t apply on stressed/wilted weeds. Cut stump treatment. Best results are often obtained in late summer and early fall, but before fall color is observed in the foliage. Apply a 1% glyphosate solution to the cambial areas (inner bark area) of the stump of woody plants IMMEDIATELY after cutting. Cut and treat stumps only when the Virginia creeper is actively growing and not under stress. WARNING. Injury due to root grafting may occur in adjacent plants. Do not treat cut stumps if there is a possibility of root grafting to desirable vegetation. 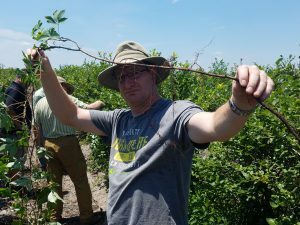 Do NOT allow contact with green bark, trunk wounds, leaves, or root suckers of blueberry bushes. The mention of trade names and rates is for educational purposes and does not imply endorsement by the author or the New Jersey Agricultural Experiment Station. Always defer to the product label for instructions on properly applying an herbicide.